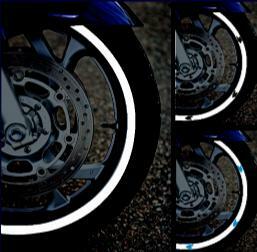 Streetglo - Invisible high intensity white reflective black tape strips kit for black motorcycle frames, bicycles or other vehicles. Your entire motorcycle frame can be one HUGE reflector! Black tape that magically reflects bright white - yeah right! It really does! That's why we call it MagicBlack Invisible Reflective Tape! Invisible when installed on any black object. Superblack strips are provided in 1/2" and 5/16" sizes. You get 8 of each approximately 7" long per strip (56" overal in lenght for 1/2" strips and 56" overall in length for 5/16" strips (112 inches overall when combined per ket). Invisible (black tape on black object) reflective tape. 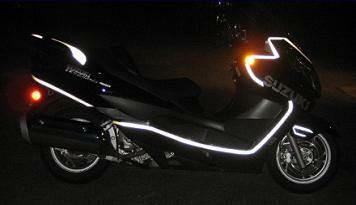 This is our "SUPERBRIGHT" Black reflective material. Works great on Black Bicycles or other Vehicles. Barely Noticable in daylight... Superbright white reflections at night to oncomming traffic. Can be applied to Black Boot Heels, Stationary leather, or any stationary black objects. For most applications of Magic Black Frame Tape decorative reflective tape on cars, trucks and motorcycles, it is often a good idea to use bright and contrasting colors on your helmet, fenders, farings, etc. However, a motorcycle frame looks quite unattractive with bright reflective tape installed on the typical black painted frames. While our ordinary reflective black tape is reasonably reflective, our SuperBright Black reflective vinyl is available only in custom cut black reflective strips that can be applied to any back vehicle or object, such as a black motorcycle frame, resulting in what appears to be invisible reflective tape (black on black). This is an excellent way to protect the original black appearance of your motorcycle frame or other black parts while gaining high reflectivity at night when seen by an approaching vehicle with their lights shining on your motorcycle or vehicle. You can use Magic Black Frame Tape super bright black tape on any black frame, fender or on Leather Seats or Saddlebags.